It's bitterly cold in Paris - where's "our" homeless guy? Our homeless guy's bench. He's a bit of a hoarder. I'm a mom and one of the identifying characteristics of moms is that we tend to worry. My worries range from the mundane (Are my adult aged kids brushing their teeth before going to bed?) to the more global (Is Iran developing a nuclear weapon?). 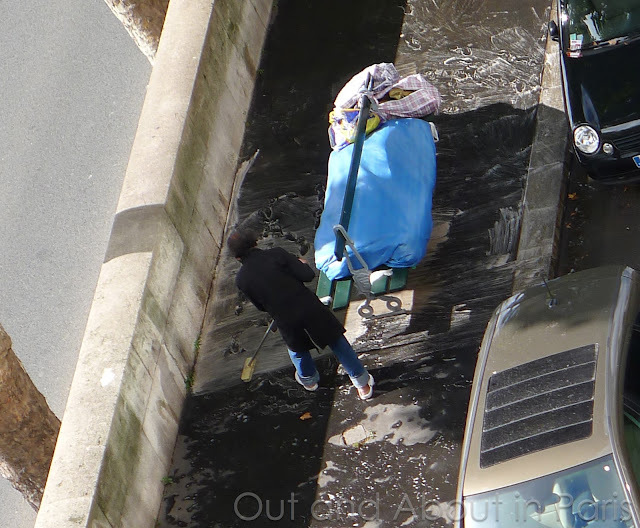 With below freezing temperatures in Paris this week, I'm currently worried about "our" homeless guy. Just like the baker, the waiters at the cafe and the man at the newsstand, our homeless guy is an integral part of the neighborhood. Well, we actually have quite a few a homeless guys - there are two in front of the bank who offer helpful advice about how to open the door with your bank card; one in front of the grocery store who always says, Bonjour, madame, and asks for spare coins; one in front of the bakery who looks at me with soulful eyes and an outstretched hand; and "our" homeless guy. With a perpetually jaunty step and upbeat attitude, he's an enigma. What's his story? Why is this guy living on the street? Since I can see his bench from our living room window, I frequently find myself checking on his well-being. He's fastidious and regularly gives the entire area a good scrub before rearranging all of his belongings under various waterproof tarps. In the morning, he airs out his bedding and then stows it away for the day. I know that he gets fresh water from the Wallace fountain behind our apartment in the summer, but what does he do during the winter? But even more importantly, he's missing. I haven't seen him for the past couple of days. My only hope is that he's in a shelter. According to a bulletin on the official website for the city of Paris, there are an additional 550 temporary beds in gymnasiums and 140 beds in shelters during periods of extreme cold. According to a recent article in Le Figaro, there are an estimated 5,000 homeless people in Paris. It's freezing cold out there! If you see a homeless person who is in dire need of social assistance, call 115 (Samu social). For an emergency, call 15 (Samu) or 18 (firemen). Our homeless guy scrubbing the area around his bench. Come to think of it, his pile of belongings has grown considerably since I took this photo in August. He really needs a home where he can store all of his stuff! your" guy....if he is truely a hoarder, he won't leave his things unattended for long. I bet he is there during the day to check on it. (while you are "out and about"). Hopefully, he has common sense to know where and when to find shelter in this weather. In addition to being friendly, he looks as if he has a good deal of common sense so you're probably right that he's nice and warm in one of the temporary shelters. I hope so! I just took a peek out the window and all of his belongings are covered with snow. I remember being worried about "my" homeless guys à la motte-picquet. They disappeared when the weather was frosty but they did in fact return, so I think "your" guy will be ok. It's a good thing that he is not outside. I remember "your" homeless guys - "the boys" - from when you wrote about how your mom and you took them some food. That was very kindhearted of you. I'm sure that my guy will turn up once the weather has improved. As you said, it's much better that he's indoors. The authorities seem to be looking after the homeless. If it gets colder, I believe they can requistion gymnasiums and halls for the people to sleep in. Goodness knows how they survive out in these temperatures. While it's true that the authorities have a plan to help the homeless, the 690 temporary beds in the gymnasiums doesn't seem like enough to provide for all of those who normally sleep on the streets. I've noticed quite a few seeking shelter in the metro. One station had a small village of homeless people camped out on the benches. This is an interesting story, one that I think many of us in large cities experience. Chicago has a very large homeless community and they are more 'aggressive' in asking for donations than I had experienced on the east coast, although I have gotten used to it now. To wonder, "what is his story"--I find myself doing that too, some people just catch you like that, and others we can pass by without a thought--oh the human condition. I like how you quote the guy in front of the grocery, saying, "bonjour madame" and I recall reading somewhere that the French always follow the salutation with a personal title (or whatever that part of speech would be called). We English speakers just say, "hello". Would you (dare to) interview the homeless man on a better day? That's interesting that you mention Chicago because I felt more nervous when approached by a homeless person there than I do here. As you said, they can be quite aggressive. On the other hand, all of the homeless people in our neighborhood are very polite and try to be helpful to earn a bit of money. Oddly enough, my homeless guy never asks for money. Perhaps he "works" in another neighborhood and sleeps here. One of the reasons that I noticed that he's missing is because I wanted to interview him this week. My plan was to ask him for lunch, or at least a hot drink, at a cafe. I definitely would like to talk with him because he's a part of Paris. The sad thing is that the longer I live here, the more accustomed I am to seeing homeless people. They don't have the same impact on me anymore. I was with a longtime resident of Paris the other day and when I mentioned something about the group of homeless people we had just passed, I could tell that they hadn't even registered with her. "Oh the human condition" is right. I worry about "our" guys too. And I wonder if your grocery guy is the same fellow my husband and I refer to as Monsieur Bonjour. We live in the 8th but I have run into him in the 16th. One of the other guys on our street always refuses to go to a shelter; I am so afraid this may be his last winter. That is worrisome when someone refuses to go to a shelter. My husband walks to work and the first week that we were in Paris, he came across a homeless guy on a bench who he thinks was probably dead. It was freezing and he was sleeping without any shoes. When I asked him why he didn't call for help or do something, he said that he didn't know who to contact. Now we do. It looks like you are getting the cold and snow that your friends in Boston haven't had this winter. Keep warm and caring! I was thinking about making a trip to Boston in February and everyone thought that I was crazy. It may be "crazier" to stay in Paris this year!